By providing a direct channel of communication between operator and passenger, we have helped East Midlands Trains (EMT) to better understand their customers in order to improve services, increase engagement and grow revenue. 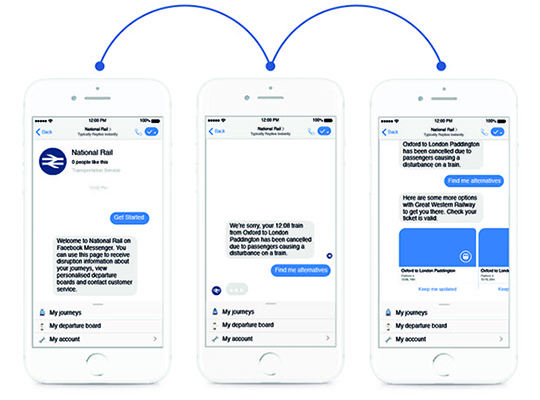 Zipabout Connect allows EMT to conduct targeted, personalised customer research in a two-way conversation delivered conversationally through Messenger. With no need for long surveys, Connect drives customer engagement and - by automatically aligning responses to customer behaviour, network performance and environmental inputs - creates hugely scalable and detailed insight into passenger needs. Using the Messenger channel, Zipabout Connect also allows EMT to notify passengers of journey disruption with personalised direct messages, all underpinned by the Zipabout transport data platform and a GDPR-compliant opt-in model. With information delivered directly to individuals through Messenger and personalised to real-time passenger experience, Connect has allowed EMT to gain an insight into how operational issues, disruption and the provision off facilities affect customer experience. Findings are mapped directly on to the live transport network, combined with the behavioural insight generated by the Zipabout platform and reported through a sophisticated analytics platform. By talking directly and consistently to customers, EMT can better understand passenger behaviour and give them exactly what they want – from improved customer service to personalised loyalty schemes. The complex data analytics Connect provides allows EMT to manage disruption, control capacity and improve services.